Typography is important in everyday life. It appears everywhere, on packaging, web, books, bottles, store fronts, road signs and cars. The list goes on. Typography is useful because it conveys information to the reader, be it on a subconscious level or very clear and maybe even glaring manner. Depending on what the typography is used for, it can be designed to catch the readers eye or as very readable information about contents of medical packaging and nutrients on foods as well as for other descriptive purposes. Arranging lettering and wording can have a massive impact on the readability and composition in a piece of wording.The arrangement in relation to other words and titles as well as placement within artwork, magazines and newspapers affects the experience of the reader. Typography comes into play specifically when we choose fonts, review and decide upon spacing of lettering, words and lines. When we choose the size of the letters as well as the length of the lines. With this we ensure how the copy of text looks like as well as ensure it is as easy as possible to read and flows well for the eye. Typography is a lot of things, however it is easy to get the definition wrong so it is important to understand what typography is not.Typography can be a very broad term however it can often be misunderstood. Handwriting along with lettering for instance is not typography. it may contain elements used in typography, however these things along with sign writing, graffiti, are not, even though they can be supported by typography. Confused yet ?, i am. Recap : Typography is not hand lettering, graffiti and sign writing etc. however elements like line spacing, size and composition as well as placement of lettering is. Tundra, this is an example of where naming of the font describes the inspiration of its creation.The designer mentions specifically that the name of the font was in place before he started creating it. The font Tundra is created for comfortable and easy reading. This is a Serif typeface which is preferable for longer text copies. This means that it would work well as a font used for the main text in a book. By manually graduating the weights of the font the creator made six different weights, meaning the font can be used with different weight sizes and can be applied appropriately for the particular design you may have in mind. An image is carved oput of hardwood. The piece is then covered in ink by the artist or print maker and then used to press prints, either by hand or with a print press. This is the same principle as the wood engraving, however instead of hardwood, Linoleum is used in this process. Drypoint is an illustration or image carved out on a soft metal plate before it is inked up and the cvarved illustratrion is then printed using a a print press. In etching, wax is applied to a stiff metal plate. The wax is then etched to get an illustration or image. The plate with the wax illustration is then lowered into an acid bath. This sears the exposed metal. The plate is then inked up and used in a press. In engraving lines are cut into a metal plate to form the illuystration. it is then inked up and used in a press to create the illustration. Bank notes are created this way. Wax is layered on a stone tablet to form the illustration. The Ink wont stick to the wax so when the tablet is used it creates a negative drawing on the paper it is pressed on. A drum is rolled over, transferring the image to paper. In screen printing the masks make up the lines in a silk screen to create a design. Coloured inks are then used and pressed through the screen using a squeegee and onto paper. Monoprinting is simply ink on a glass pane, which is then manually pressed on paper. Digital printing is used for Digital Fine art among allot of varied types of illustration work. For the most part limited editions etc. Find a poem that inspires you and illustrate your poem. Learning Activity – Graphic Design History. as well as current designs that are influenced by these styles. Look at the history timeline at the beginning of this lesson. 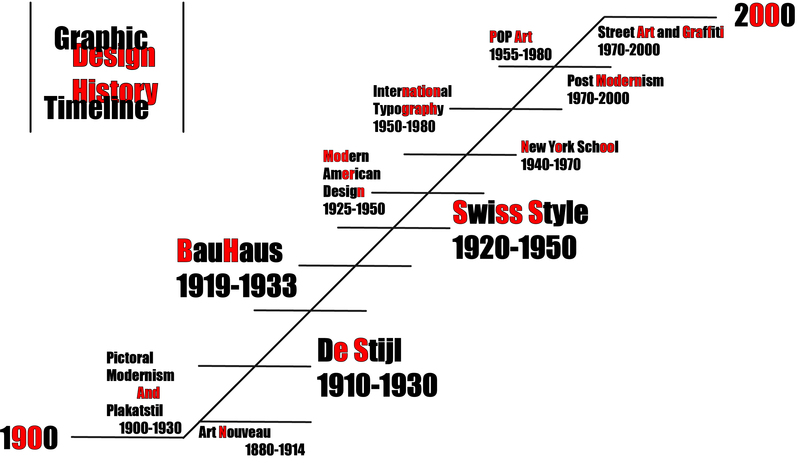 Gather information from 1900 – 2000, and design your own timeline using the Swiss Design Style as your theme. Each movement should be described in a creative way. Experimentation and problem solving at the Bauhaus is enormously influential for the approaches to education in the arts.It has led to the “fine arts” being rethought as the “visual arts” and as a form of research and the use of a more scientific approach. The De Stijl movement (The style),The futurists and constructivist wanted to destroy the old world and create a new on based on the machine, industry and socialism. De Stijl rejected the traditions they belive caused world war 1, but unlike the futurists and constructivists they wanted to rebuild the world with an approach that merged math and harmony. in 1917 a group of artists, architects and designers met in the netherlands. The leader and one of the founders, Theo van Doesburg said “The old is connected with the individual, the new is connected with the universal”.In 1924 the movement disbanded because of disagreements over styles and ideals based on the human condition and need for personalisation of styles and individuality. The swiss movement also known as International Style in graphic design, does not simply describe just a style of graphic design made in switzerland. It became famous through the art styles of designers from Switzerland, Russia, Germany as well as the Netherlands in the 1920`s. This style of art, architecture and culture became what is known as an international style after the 1950`s. It was produced by artists from around the world, despite this it is still known as the Swiss style and the swiss legacy. “Perfection is achieved, not when there is nothing left to add, but when there is nothing left to remove.” -Antoine de Saint-Exupéry. The Bauhaus style has clearly influenced these artists creating new designs for movies, gatherings as well as posters that represent the style iutself. The first poster is from the era of the Bauhaus movement. The three other images are relatively new designs crated post year 2000. The poster in black and white is from the era of “De Stijl”. I remember De Stijl greatly influencing alot of Ikea furniture in the 80`s-90`s. Making a comeback every now and then it is clearly a very influencial style of design. The swiss style is greatly influencing designers all over the world today and is in my mind the definition of design.Whether designers know it or not most styles can be traced back to this specific style in some way. this also holds true for the Bauhaus as well. however the swiss style has a tad more freedom to work with and therefore have a wider demographic.